Happy Monday everyone! We had a busy weekend here, busting out a bunch of projects around the house with the help of my parents. We were able to paint the living room, hallway, dining room ceiling and master bedroom. Plus fix the garage door and winterize the dog house partially. It was a whirlwind and I am exhausted! 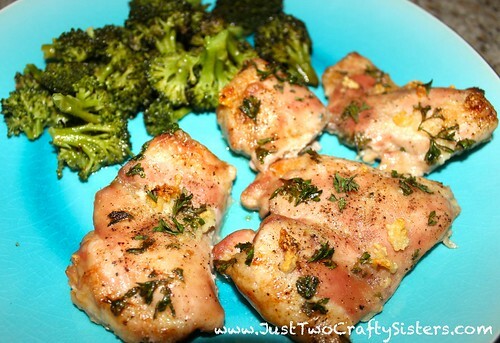 This week I am sharing a simple recipe of lemon garlic chicken thighs made out of items we had on hand. I did not follow a recipe for this one so you have to bear with me on a few vague measurements. Preheat oven to 400 degrees. 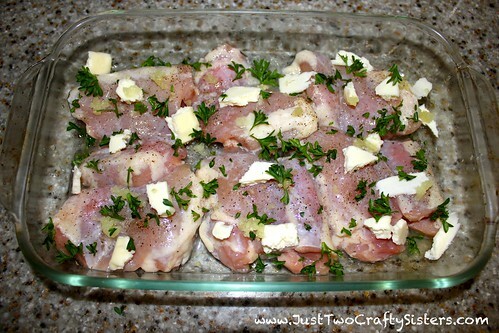 In a glass baking dish, place you chicken thighs. Pour lemon juice over the thighs. Cut butter into small pieces and distribute throughout the baking dish. Mince garlic over the chicken thighs. Season with salt and pepper and top with fresh parsley. Bake for 25-40 minutes, or until cooked through fully. Serve and enjoy! 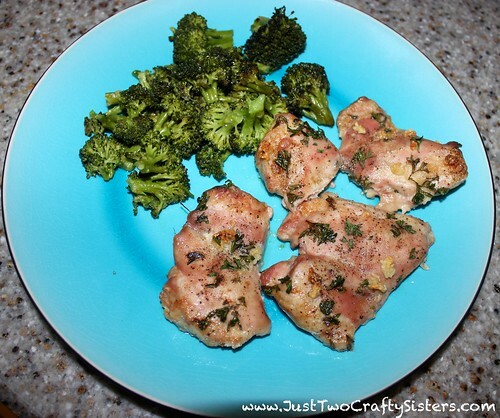 We have ours with foil packet steamed broccoli (recipe coming soon). These thighs were delightfully juicy and very flavorful. Definitely a a hit we will be making again!